Beam is a part of the Electrolux group which is a swedish company and the 2nd largest home appliance manufacturer in the world. Electrolux has been making vacuums and other home appliances since the early 1900s. Through the Beam brand, Electrolux has developed central vacuum systems for about 6 decades. The 14” Beam Cleanstream HEPA Filtration bag (#110348) also utilizes the drop-down design and gives you HEPA Filtration, filtering dust at .3 microns and larger at 98% efficiency. Some Beam Vacuums such as the On Board Vacuums 33s, 34, 35, 36, 36B and BM145 have paper bags that need to be changed periodically. These hygienic paper bags keep you from handling all the debris collected over months of regular vacuum use and help keep your air cleaner. Changing the bag on your central vacuum keeps suction performance running well and can increase the life of the vacuum. Be sure to change the vacuum bags whenever you notice a loss of power, after vacuuming extremely fine dust, if you notice any odors, or when the bag is clearly full. Other units using disposable bags include the ATLIS, the Mobile Maid, the Salon Vac, Boss units, Beam Marine, and Powerline. 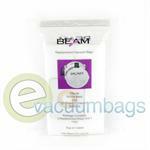 Beam 3 Gallon Paper Vacuum Bags for Beam Mobile Maid and On-Board Vacuum Cleaner Systems.